Now available in brass and brushed aluminum finishes. Pewter finish price increase: All Pewter finishes will have an additional refinishing charge due to the high cost of plating and polishing needed for these Pewter finishes. 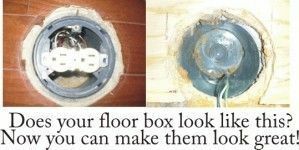 Please note: There are no floor boxes along with our Finishing Rings. To order floor boxes, see section #17 on the left side margin of every page. We have lowered our price on our Finishing Rings in Brass to $49.88. But there are several Pewter finishes that require more plating and finishing and the price is an additional $55.00 for these custom Pewter finishes. 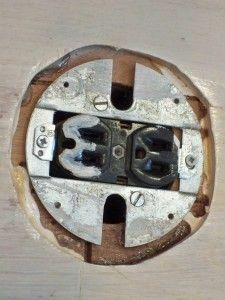 This ring will cover areas of tile or wood that has a rough edge around your round electrical floor box cover if it is damaged, or was cut improperly. Inside round opening (I.D.) 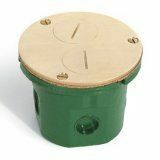 is 4 inches, and the overall outer measurement (O.D.) at 7.5" inches is our standard size. Also available in 4.5" (I.D.) by 7.5" (O.D.). 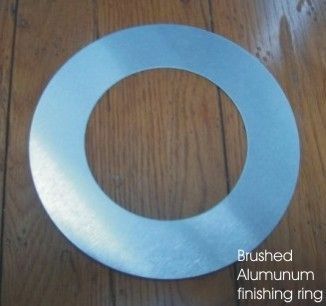 The Finishing Rings are also available in our 38 custom finishes for an additional charge. Available in Brass now for $49.90, from $69.90. 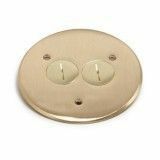 However there is an extra charge of $55.00 for all custom Pewter finishes which need additional plating and refinishing required than the standard brass and aluminum standard finishes. 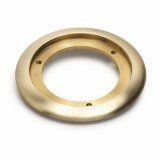 For custom finishes there is an additional charge of $49.90 each ring, but does include all shipping charges and there are three of them we have to do. One to our factory, one to the finishing company, and one back to the customer. 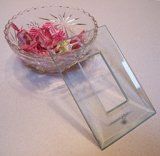 These also can be finished in one of our 38 custom finishes for an extra $49.90You will receive a sample chip for $3.00 at this page /Custom-Floor-Box-Sample-Chip-Finishes.html which will be refunded with your confirmed order. 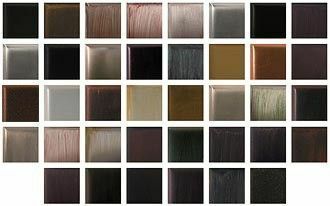 Once you receive the sample finish, you will be asked to sign-off for the approved custom finish. After the final approval, we will start your order, and these are non-refundable in custom finishes. However, these are not intended for high traffic areas in the custom finishes. Usually they are under a table for a lamp, or under a desk where they are seen, but not constantly walked across. Cover-up-Rings is a Brass Plated Ring at $49.90 ea. Any 38 Custom Finishing charges $49.90 extra. Size in 4" or 4.5" inside dimension with 7.5" outside dimension.